I worked as a Product designer on designing a mobile app from scratch. 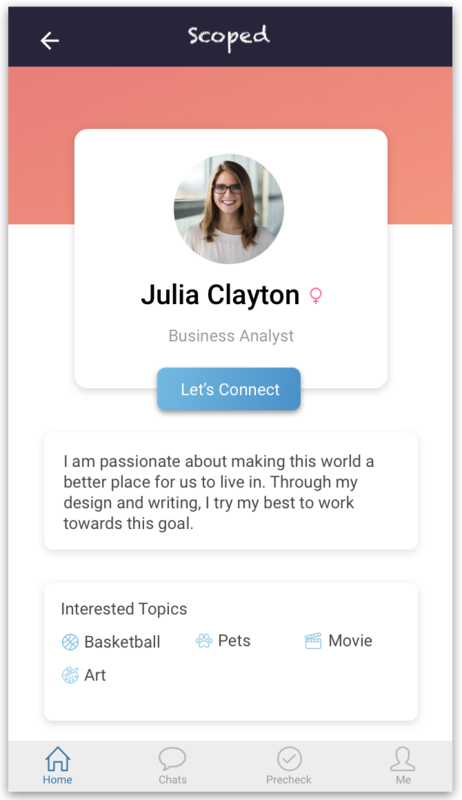 The purpose of this app is to connect people around the same location and have a quick chat before they meet in person. This product is developed by a startup, Scopd, in Pittsburgh. How do we make it easy to reach out and make connections when people are in a social setting? We began our design process by first conducting user research to know about users’ concerns when they reach out to people in person. We used qualitative (user interview) and quantitive (questionnaire) research methods combined. We also gave out questionnaires to understand what content/words users prefer to include in our design. According to the insights, we decided on three goals that we are going to aim for in our design process. 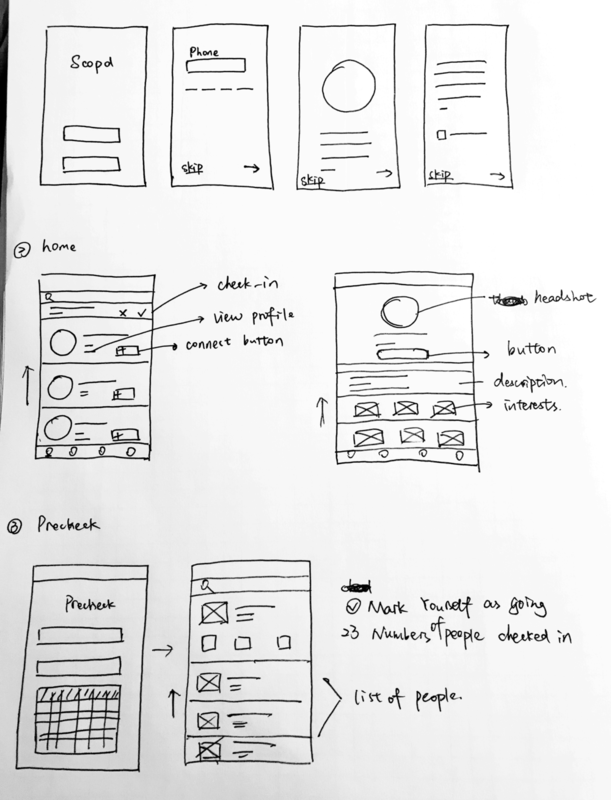 We began sketching out the initial user interfaces for the mobile app. Quick thumbnails and notes allow us to rapidly prototype our ideas before finalizing our designs. We also decided the features that we would like to include in the final design and tested if users could understand our language used in the app. Once we nailed down the features, we were ready for adding visuals. We researched about other apps for connecting to get a sense of current design trends. We made sure that our design was created by the most recent iOS UI conventions in mind. 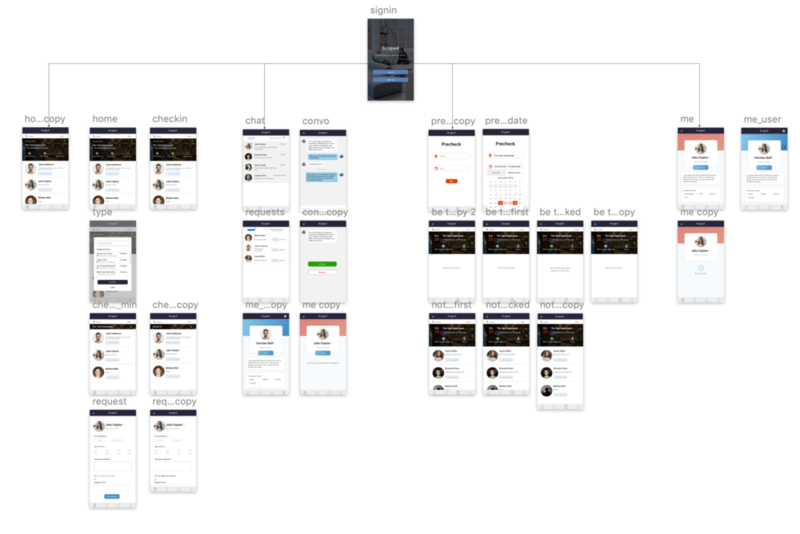 In order to solve the design challenge, we include four key design features in our MVP. 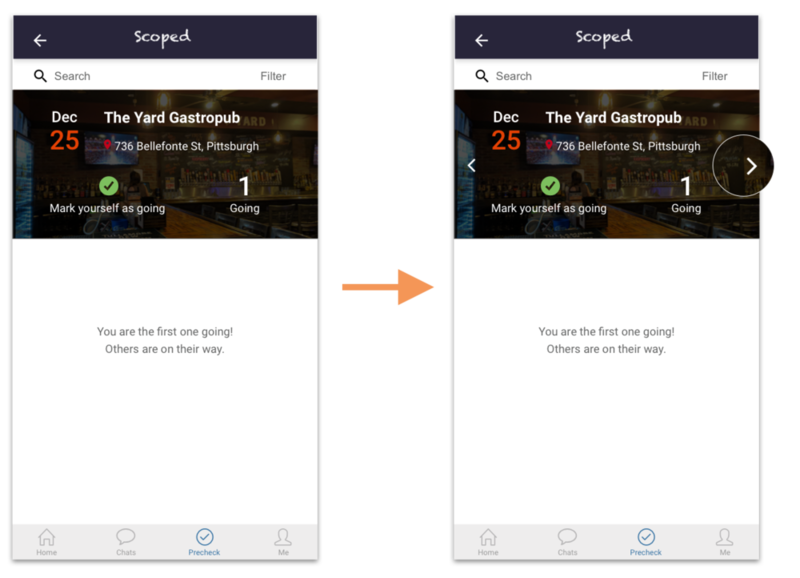 The app automatically detects the place and users can view others around them. They can choose to check in or not. If the place is wrong, they can type in the place manually. Users can precheck in before they go to a place. It’s better to know who is going before they go. Users can select one day or multiple dates to precheck. We tested users’ understanding of precheck and the data proved that they all understand what this feature does. Users can chat with the friends they just add. They can also view their profile first so that they know each other’s interested topics and ease the tension when meeting first time. Create personal file to let others know users’ interested topics, career, life, etc. so that they can connect to people that share similar interests and start the conversation easily. We asked the users to think aloud as they went through the prototype and checked if there was any confusion in the user flow. We also asked them to complete certain tasks to see if the design is intuitive enough. It is rewarding to see how users act positively about our app. 4 out of 5 users would like to download our app without our prompting. WHY Multiple dates is always needed by people who are attending conference for a couple of days. This was my first industry experience being a product designer in a startup environment. Thanks to Josh, as our Product Manager allowing me to have my design ideas put into real. And this was also a great experience where I learned to take business value into account while I design. I learned a lot working with a team of PM, designers and engineers.